Let Your Flowers do the Talking | Food It Yourself! Yup, Old Man Winter is, evidently, still drunk. He is currently blasting coldness, snow and ice all over the USA. Something called “snow rage” has been identified in the North East. Let’s think about something happy. Flowers make people happy. Let’s talk about flowers. Did you know you can communicate with flowers? Many cultures have placed symbolic meanings on plants and flowers. Nordic people saw the acorn as a symbol of immortality. Bamboo has been a symbol of longevity and success in China for eons. Laurel was a badge of victory for the Romans. From traditions like these comes floriography, the art of creating messages with flowers. Here is a little history on the subject from How Stuff Works. Victorian Bazaar has a little history and a big list of flowers with their associated meanings. 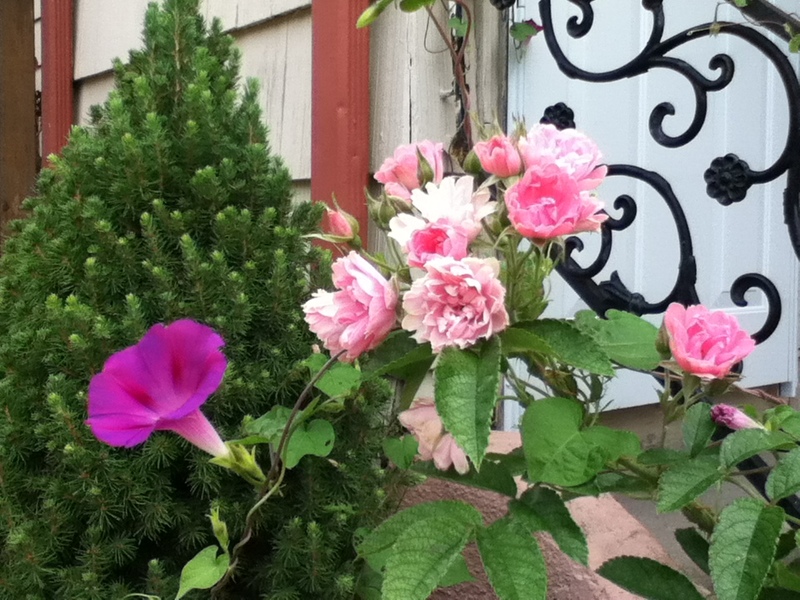 Pink roses for gratitude and morning glory for mortality. The message: be thankful for fleeting, beautiful things. Still undecided on what bee magnets you want in your garden? Why not delve into a little floriography yourself and send a message with those flowers! Of course, we can update their meanings for the 21st century. Here are a few combinations I have considered planting, along with the traditional meaning of the flowers and the modern message I think they send. For the record, I used this list for the meanings listed below. Here are a few more on-line resources on the symbolic language of flowers. Yes, there is a little inconsistency between them but this is just for fun. What message are you planting in your garden this year? Share in the comments section! The Old Farmer’s Almanac has a nice list. About Flowers has a good list also.